Another Geind revolver, this one a later model than the previous one I just posted. As with the EL-522 this one employs the same principle of using flechette (Shett dart or SABOT) shells that have a special resin that the weapon sends a charged jolt into which fires the round. The handle on this one is a straight up combat grip rather that the simulated catalin the previously posted model has. Geind's naming conventions for their shettier designs are by model number only. They're well known for revolver designs. 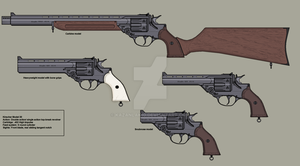 Forgot to note that I started riffing off old west 1800s revolvers, not modern weapons, when I began this batch of thumbs. I more or less deconstructed aspects of those old guns I found interesting and put them in the TKP blender. Pencil thumb converted to digital inks and colors in Photoshop CS3. Can I model it for my game please ? Very nice, kind of reminds me of the Judge. perhaps consider making a longer heavier barrelled version for longer range/accuracy? Thank you, I appreciate it! All I can say is just keep at it, keep looking at real weapons for design ideas and just experiment. The more you work at it the better you'll get. What are sabot rounds anyway? They are typically a flechette round with a break away casing (the SABOT which breaks away after leaving the barrel) to hold the round steady in the barrel when firing. They have been used in small arms and have been proven accurate and deadly effective. Yeah it's pretty interesting seeing the real world uses of these type of rounds. A lot of weapons have effectively employed them and they tend to be incredibly accurate. I created a 'chette sabot weapon for my halo RP. Thanks for making fantasy/anime/sci-fi weapons that actually look like they'd work! When it comes to weapon design I don't particularly like pointless visual "sci-fi" clutter that seems to be all the rage with concept weapon design. You look at real weapons, even at their most visually complex, and you always see functionality and purpose in their design. I find solid clean lines with a strong silhouette makes for the most visually appealing outcome. There has to be a sense of flow. Did you do work on the "Rifts" games? Or take some inspiration from them> A lot of similar lines, etc from the art there- some of the best game art there is, I believe. On another note- I may have to build a couple of your designs, if you are OK with that. They would be fully credited, of course- again, assuming that you are OK with the build in the first place. I have indeed worked on Rifts material and there are some pieces from my work with Palladium books in the gallery. As to inspiration, honestly no, none of my personal or studio work was inspired by Rifts or Palladium at all. This isn't to say I didn't enjoy my work on those book or that they are not inspiring in any way (clearly they are), they simply were not inspirations to any of the Theos material at all. However the work I did do for Palladium WAS inspired by the materials given to me for whichever book I worked on. The actual work I did for Rifts was designed with their materials and settings in mind. The last gig I did for them was Rifts Dimensional Outbreak and that was a lot of fun I tested some of the black & white techniques I was developing for my own work on that book. As to building any of our designs, you're more than welcome to do so We're always humbled by the interest in the work and any fan builds, art, sculpts, whatever are always appreciated. Aye, all we would ask is credit for the design and links back to us. We'll immediately fav any works of that kind and add them to the fan art gallery. Heh. I was showing this particular pistol to my friend- he thinks we can make it actually work... Probably (due to common ammo~) in .357 magnum... Also some ideas for real-steel functional ones you have drawn. More to follow, assuming it actually happens, of course! Again- great designs, love the work- and look forward to seeing whatever else you post! Sorry for the delayed reply, been getting busier of late. That sounds pretty wild man so, by all means, keep us posted Never got into calibers for the weapons because the setting is pretty removed from our current times today (the notion is they have a different way of defining caliber), yet there's still a sense of strange familiar. That said, yeah, I could see .357 Mag based on the design I drew. Now this is a very nice snub-nosed thing, almost looks like a coat or hidden carry model though I guess it's a bit big for that still. Very stylish. Only question, is that a loading port? It could be hidden in a coat but would more likely be carried in a shoulder holster by plain clothes and P.I. types. It's probably slightly bigger than the Chiappa Rhino in size. The drum, I had imagined, would flip out on the other side in the more common revolver fashion so that part on the visible side was simply an odd part of the original thumbnail that I didn't omit. Being this actually started from riffing off old Civil War revolvers (of all things), yeah I think some of that snuck in as they did have loading ports. This looks so sharp. Awesome design. Some kind of replica would be pretty cool. If it were real, as I noted on another reply, that would be a bit weird having designed something that could potentially kill someone (as fiction it's a different matter of course). If I personally wasn't the designer, yeah, it would be a pretty badass real weapon to have I suppose Glad you dig it! Good, i like it! But an explanation: Is "Made in Spain" or in spanish, "hecho en España". As noted below it has nothing to do with Spain. Spana is a fictional political bloc in the story with no concrete historical ties to the Spain we know today. I'd love a replica of it but if it were real I'd have to contend with the fact people would potentially be getting plugged with one, not so keen on that. I do enjoy designing stuff like this though. Guess I'm just fine with fictional for now My thanks for the kind words. hahahaha yeah that is true.. your concern reminds me of japanese sword sharpeners and makers. They create beautiful swords but they are also aware that people use them to kill.. surreal. There is a whole philosophy about weapon making and the use of them. The only philosophy i am well acquainted to is the Japanese. Like there is a goood one about Weapons are means to both realize our weakness as well as taking ourselves away from the meaning of true strength. I do have to say.. for every weapon (though it can end a life) It is because it can end a life that makes it beautiful..
Other than that, it is my pleasure to give the kind words. It looks comfortable to hold, somehow. Also like the smooth textures on it, nice work! that's one awesome looking gun, dude.